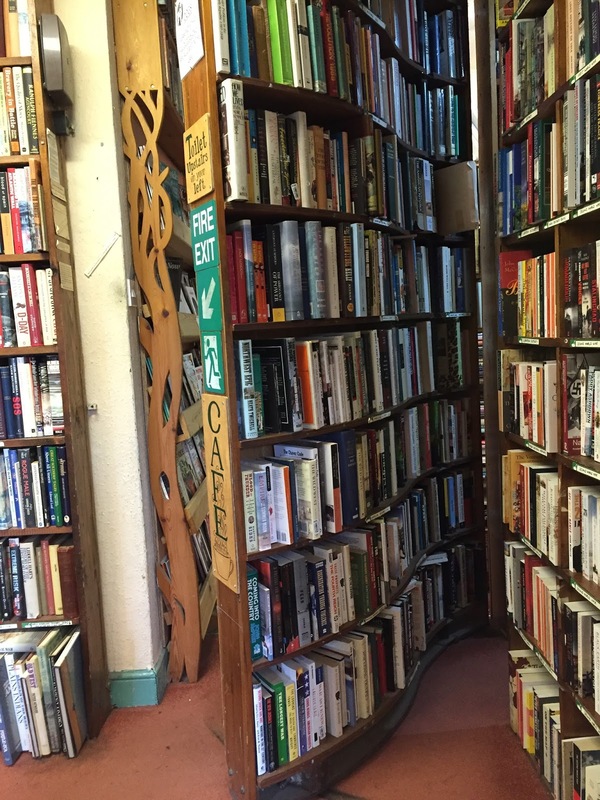 Hunting for an as yet unvisited bookshop is a bit like the search for a specific book. You know what it is you're looking for, you may even have a clear image of it in your head and an expectation of the pleasure when you find it. There's even a good chance you'll know where to look for it according to the letter of the alphabet or address of the shop. But none of these things mean you will actually find it. In the case of the book, someone bought it first. In the case of the bookshop, your Sat Nav took you in the wrong direction or, as is usually my experience, you missed the turn. For this week's bookshop I so spectacularly missed my turn I ended up in the next village of Matlock Bath. Home to an odd combination of tacky amusement arcades and atmospheric countryside, there was something about the incongruity of those bright lights in Derbyshire that made me determined to return for a longer visit when I finally get my Elizabeth Bennet-style holiday. But for now we return to my reason for visiting the area, the famous and hugely popular Scarthin Books. 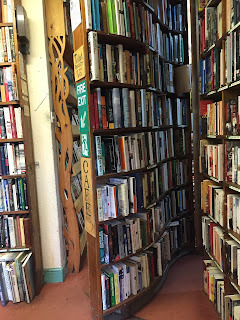 It's already featured in the guest post section of this blog, so I had some idea of what I was looking for, but it's only by personally visiting that you can appreciate the true appeal of this bookshop. Firstly, it's massive and there are books everywhere. Okay, so the latter comment is a bit obvious for the contents of a bookshop, but it really is crammed. So much so that a few years ago the building needed to be reinforced to prevent it from collapsing under the weight of all the books. These books are new and secondhand, covering all the usual suspects and then some, including military uniforms as one of the more random subjects I've found in a bookshop. 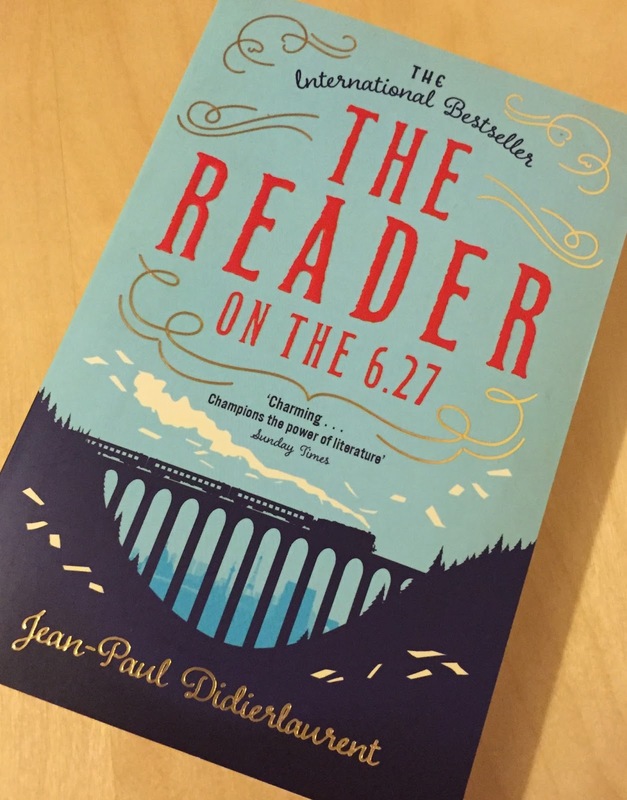 I ended up in my usual favourite spot of the new fiction area, spending some time appreciating the variety (including science fiction) before selecting a title from their new releases shelves: The reader on the 6.27 by Jean-Paul Didierlaurent. Having since read the book I can't recommend it enough. The second thing of note is that the bookshop has taken over a house. Not an overly unusual occurrence, but the still intact bathroom is a reminder of its former life – and made me wonder how Scarthin Books compares to Shakespeare and Company in the glory days of George Whitman, all it needs is a few beds, a little grime and some tumbleweeds. This oddness is what makes Scarthin Books so special. There are so many rooms and nooks and crannies I wouldn't have been surprised to have turned a corner and stumbled across someone asleep on a bed. Instead I found an array of brilliantly decorated rooms, their art vying for attention among the books and never more so than in the art room with its carefully selected furniture and stunningly decorated ceiling. Further details include the ceiling of the children's room, staircases crammed with books and a hinged bookcase that opens a door to the vegetarian cafe. The one disappointment of my visit was the cafe, but through my fault rather than theirs: I arrived just too late in the day to try their offerings. That'll have to wait for my next visit, when I return for my holiday. You know that thing when you plan to do something but you can't do it yet because it's not quite the right time to do so? Either you're too busy or not in the right frame of mind or – in my case – totally ignorant of how close a bookshop is to where you live. So the thing stays in the shadows, waiting for the right moment, even if that moment is more than two years in the making. For the past couple of years a woman I work with has been nagging, ordering and begging me to visit this week's bookshop, telling me it's nearby and one of her favourites. Her encouragement has ranged from polite to bossy, descriptive to abrupt, and always my response has been: one day. It's not that I didn't want to visit, this particular colleague's praise is reserved for only the best of things and her descriptions were certainly appealing, but as I've said before, there are lots of bookshops in the world and I can't keep prioritising the South East. Also, this particular bookshop is across the border in a different county and so there was no way I could believe it might actually be nearby. Map reading isn't one of my strong points. 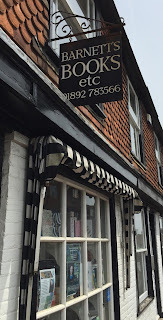 Then one day someone took me for a walk in Tunbridge Wells and suggested we take a drive to Barnett's of Wadhurst. 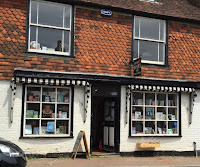 The first thing I learned that day is how very close Wadhurst is in relation to where I live, meaning – embarrassingly – it's taken me two and a bit years to visit my official most geographically-local bookshop. And what a local bookshop it is. The two rooms are small but wonderfully filled, with a bright and colourful children's section (complete with blue sky and pirate ship lamp shade) at the back and lots to occupy the grown-ups in the front. 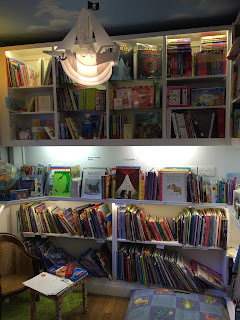 Although the children's section is at the back, a busy front room meant we'd walked straight through to explore this area first, and for a small market town the young readers of all ages are remarkably well catered for. It's a lovely, cosy space where I can imagine children settling down to play or read in safety while parents browse in the front of the shop. I later learned this is a big part of the bookshop's success, with young readers walking home from school dropping in to ask about jobs and gaining valuable experience of work in this wonderful setting. Not forgetting one young writer who's now been snapped up for her first book deal. 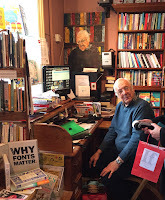 Returning to the front room we met the bookseller and one of his bookselling assistants. Possibly one of the loveliest men I've ever met, I was torn between wanting to stop and chat to him all day and continuing to explore the bookshop. 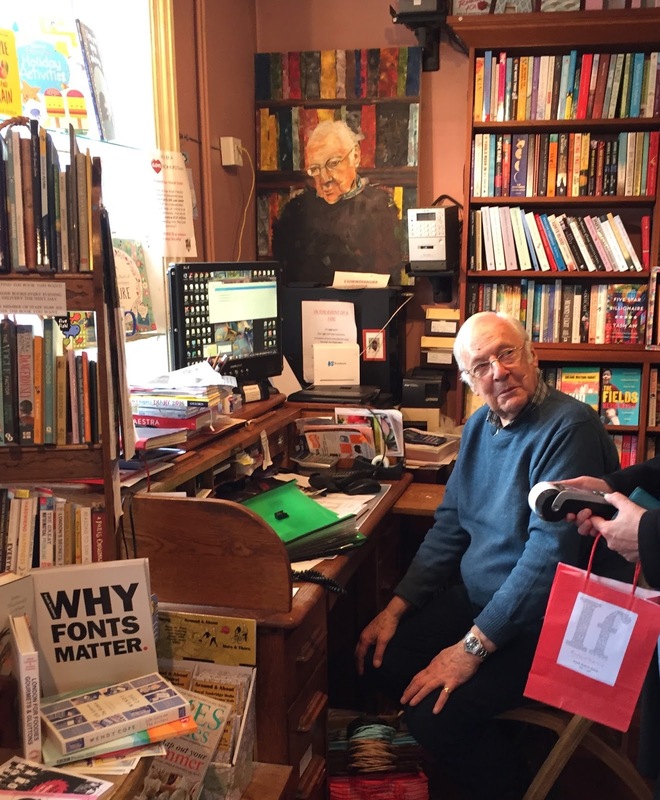 Fortunately, he had exactly the right balance of knowing when to talk and when to leave us browsing, while also sharing the story of the bookshop and his fascinating life and making me feel like a valued, long-standing customer even though this was only my first visit. 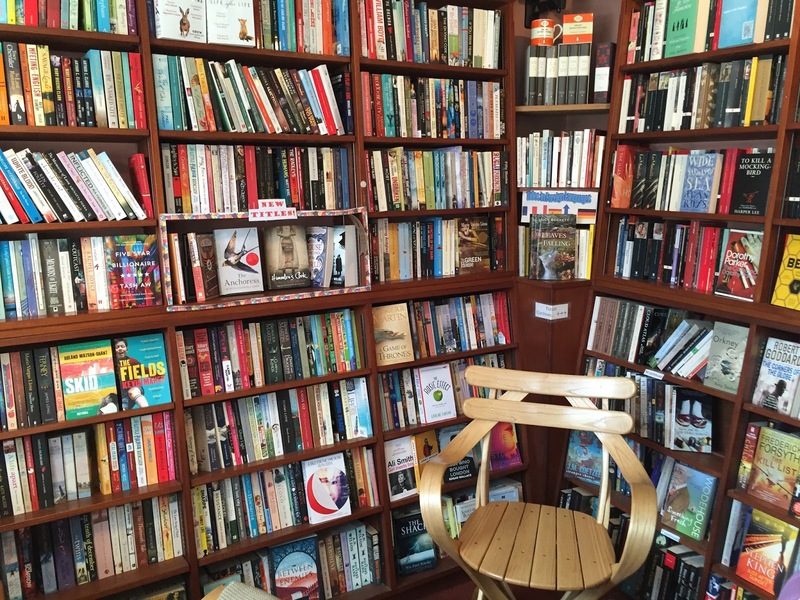 Even if you don't talk to the bookseller, the bookshop itself tells its own story. 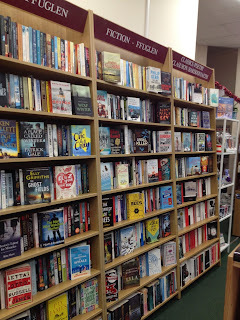 A wealth of fiction and non-fiction cover the walls and ensured a steady stream of bookshoppers dropped by during our visit. The fiction section covers just one and a bit walls but spans what appears to be every continent, ensuring a rich variety of treats to tempt and delight. Enjoying what is obviously a very carefully considered selection, I decided to make the most of the bookseller's knowledge and ask for a recommendation. 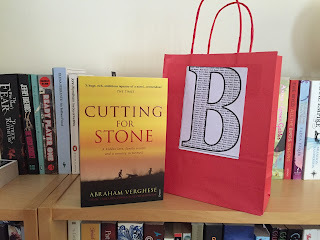 Cutting for Stone by Abraham Verghese is not a book I think I'd ever have come to by myself, but the conversation with the bookseller meant I trusted his opinion implicitly: part-way through the book I'm pleased I did because it's proving to be a remarkable, consuming read. 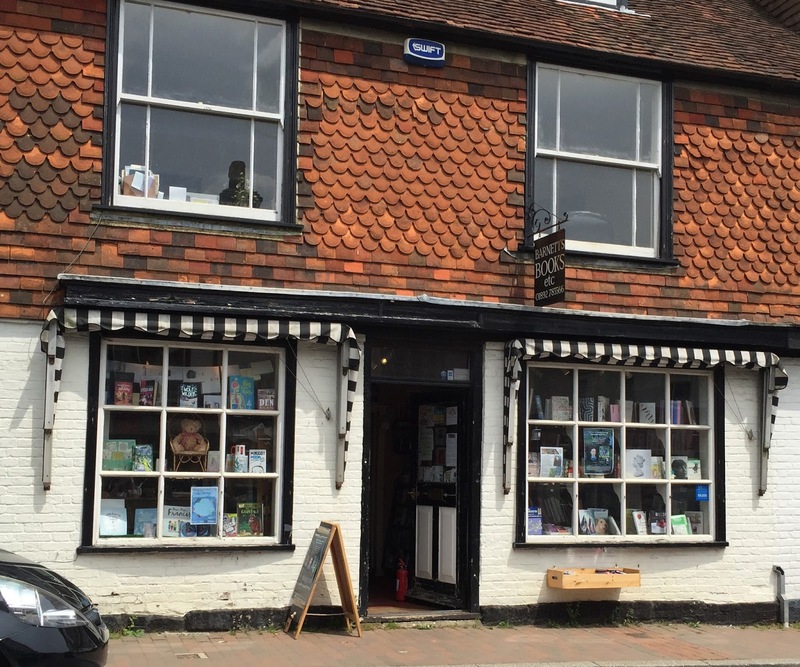 Barnett's of Wadhurst is everything a local bookshop should be and then some, with a friendly welcome, energy and a great selection of books to suit all tastes. Not forgetting a selection of evening events to meet authors – something I can't wait to experience for myself. I'm ashamed of myself for having not visited sooner but some experiences have to wait for the right moment, and this visit on this day was certainly it. The second thing I learnt that day: I was on a date. This one's a keeper. 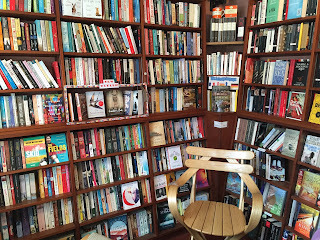 If there's one thing I hope to achieve with this blog it's to emphasise to people the variety of bookshops there are. After almost three years my travels would have become very boring if all there was to say was "I visited a bookshop, it had shelves and books". Yes, they are important ingredients in the bookshop experience, but those basics are only a small part of what makes each destination special and unique. This was particularly emphasised on my Northern Bookshop Adventure, which involved seven bookshops, all of them very different. Stop three on the tour was Castle Hill Bookshop in Richmond. Found almost next door to a castle, this bookshop stands out for being particularly proud of its Yorkshire heritage. 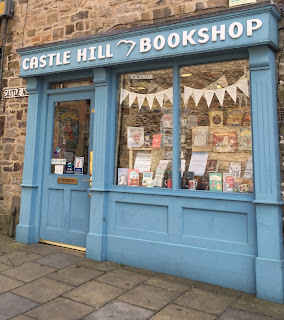 All bookshops are good at celebrating the place where they live, but Castle Hill do this particularly well with Yorkshire elements scattered across every section. As a visitor to the area, for me this started at the local interest shelves but progressed through every corner of the shop – including finding a particularly impressive number of local authors in the fiction section. 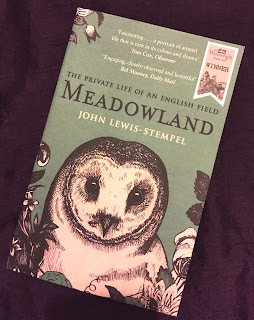 This filled me with even more enthusiasm for the area and saw me engrossed in many of the books about farming, the moors and all things northern. After dawdling over those farming books it was the natural history side of the displays that finally caught my attention, with a selection of titles focussed on our countryside meaning I chose Meadowland: The private life of an English field by John Lewis-Stempel as my purchase. Telling the story month-by-month, I plan to read it in instalments as next year progresses. Having enjoyed the variety of books (which excellently cover all the usual suspects and genres too) it was time to introduce myself to the bookseller, who introduced me to some more booksellers who'd heard I was planning to visit. If the books hadn't done enough to remind me I was in Yorkshire, the warm welcome I received certainly did. 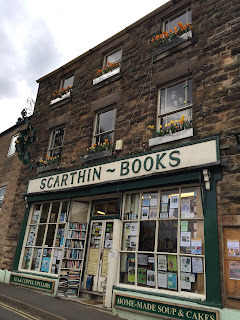 Friendly chatter, enthusiasm and a love of books, bookshops and the town itself had me feeling right at home: I've always believed northerners are among the most open people you could meet and the liveliness of our conversation confirmed this. 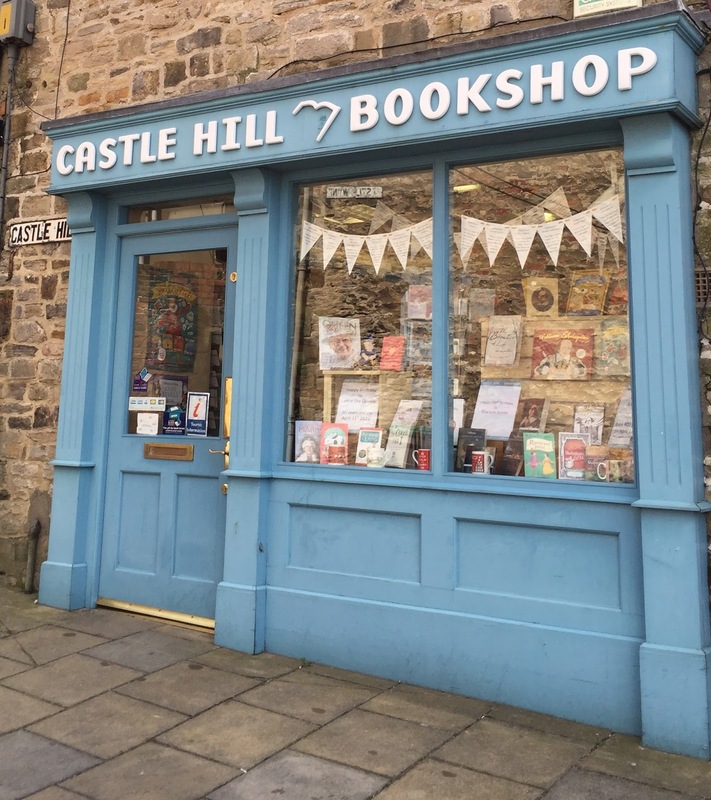 Whether you're local to the area and love it; visiting and want to know more about the locality or simply want to make the most of a local welcome, Castle Hill Bookshop is the place to go. One of the many reasons I often cite for why bookshops are brilliant places to visit is the people. Not just the booksellers, but everyone you meet there: it's the only place where you can safely talk to a stranger without making them think they should run away. 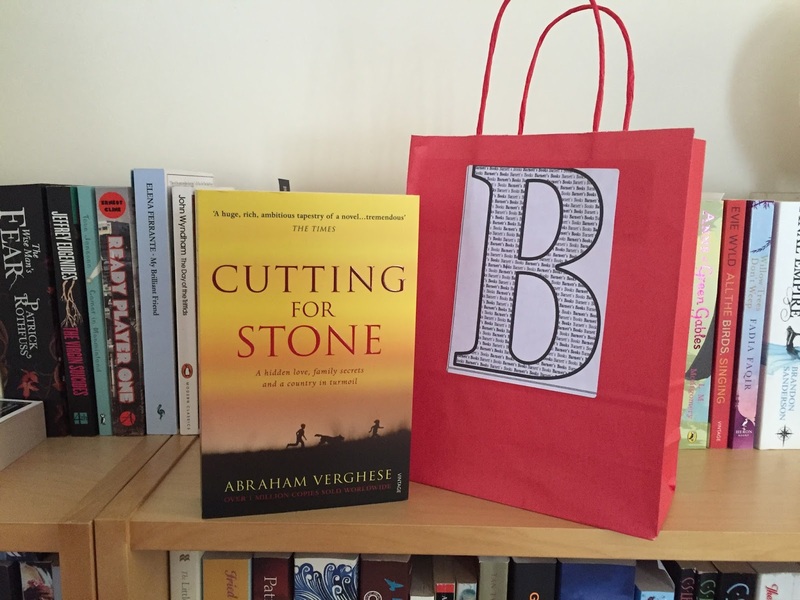 At this week's destination I met both a bookseller and a bookshopper. I say met, it was more that I invited myself to join in their conversation and they didn't mind. First let me set the scene. It was a dark, cold, winter night and I was nearing the end of a journey stretching most of the length of the M4. I had just one stop left before arriving at my sister's for Christmas to begin* and I was more than a little lost on the outskirts of Cardiff. Festive traffic after a long drive is possibly one of the worst kinds of hell you can inflict upon a person, especially when your destination is a bookshop and it's almost closing time. Which gives you some idea of exactly how tired and grumpy I was when I arrived outside the bright and welcoming window of Griffin Books in Penarth. My photography really doesn't do it justice, but the warm glow and the mystery of what was hidden behind those red drapes was enough to start thawing my mood. Considering Griffin Books is outside of Cardiff it's still a good-sized bookshop. At the time of my visit there were bundles of books on offer and a general buzz to the bookshop. Fiction is varied (including a sci-fi section to keep this geek happy) and there's an attractive children's area. However I'm not going to dwell too much on the interior because the bookseller later informed me it's due to be updated**, and as regular readers of this blog, you already know how great the stock is too. Instead I'll tell you about the people. My arrival coincided with that of another bookshopper who was looking for something fun for a friend. As I was still recovering from my drive this was the perfect opportunity to be nosy and pick up a recommendation for myself. I began by listening in. Now's when I have to confess my reasons for joining in weren't entirely innocent. Yes, I wanted to talk books to these interesting people, but I also wanted to buy one of the books being recommended. I couldn't do that if the chatting bookshopper bought them all. So I was cheeky and made a few suggestions of my own. The bookseller took them in good grace, bringing me into the conversation and enabling me to further benefit from her knowledge, while the customer was equally friendly, enjoying sharing the fun. Which is what bookshops are all about. It was a great way to forget about my long day while also learning about this brilliant local. We laughed, we chatted, we compared loves, likes and hates and we bought books. In my case it was Laura Barnett's The Versions of Us, while if memory serves the other bookshopper was much less restrained with her purchases. We may not be popping around to each other's homes for cups of tea, but we were friends for the duration of this visit and were I to live nearer to Griffin Books I'm sure I'd continue to encounter such friendships. It's the bookshop way. *Apologies, I can't always write about every bookshop the moment I've visited and promise it's no reflection on the destination. ** And probably has been by now, given how late this post is. This bookshop also appears as a gust post on Your bookshops.